This is a complete guide on Excel VBA. If you’re a beginner user of Excel VBA, you will get your best start here. If you’re using Excel VBA for a long-term, there is also something for you. This blog post lists all the step by step free tutorials on Excel VBA programming, 2 most popular Excel VBA courses, all the necessary books and a PDF where you will get a huge collection of VBA codes. “Why I need to learn Excel VBA!” – you might ask yourself. And all the above things will be done by just one click. I helped him out. I wrote a macro for his workbook, he ran it and with just one click he can now do all those things. Excel does not provide any way to do the above things. You have to write code, you have to work with Excel VBA. You know about Quora where experts answer on different types of questions. There was a question on Quora like this one: What is a good way to learn and code VBA? I answered the question with my experience, and so far 933 people viewed the answer and I got 3 upvotes. See the images below and know my way how I command over any programming languages. I am gathering here all the step by step tutorials that I wrote to help you learn Excel VBA. Just read the articles one by one and do a little practice. That’s all. If you don’t have any prior experience in coding, frankly speaking, the topics might seem to you little bit complex. But believe me, if you keep yourself stuck with these materials, you will find it easy and you will start capturing the concepts of programming. Just stuck with these tutorials! What You Can Do with VBA. How to show the Developer Tab on the Ribbon. About Macro Security in Excel. How to save workbooks that contain Macros. Two types of VBA Macros: VBA Sub procedures & VBA functions. How to create VBA Macros in Excel using Macro Recorder. Recording Macro in Excel – Learn with an Example. Assigning a macro to a button in Excel. How to assign and change a shortcut key to a macro in Excel. How to add a macro to your Quick Access toolbar in Excel. Macro recording in Excel: Absolute vs Relative. Copy your macros to a Personal Macro Workbook. How VBA works in Excel. Objects and collections, Properties, Methods, and Variables in Excel VBA. If-Then construct, For-Next loops, With-End With construct, Select Case construct in Excel. A macro example created using VBA. For Next Loop in VBA Excel (How to Step and Exit Loop). Differences Between Subroutine & Function in Excel VBA. How to Create Custom VBA functions and Use them in the Worksheet. How to Execute a Function Procedure. A detailed analysis of Excel VBA Function Procedure Arguments. An Excel VBA function with no argument. How to Use Excel VBA User Defined Function in Formula. An Excel VBA function with two arguments. An Excel VBA function with a range argument. How to insert an Excel VBA custom function. Why UserForms are necessary for Excel. MsgBox & InputBox in VBA Excel : UserForm Alternatives. How to Create a UserForm: an Overview. Adding accelerator keys & Controlling tab order in Excel UserForms. What are Excel Events and Their Types? How to entering Event Handler VBA Code. Workbook-level Events and Their Uses. Worksheet-related Events and Their Uses. How to Use Non-object Events. If you follow the above tutorials step by step, you will be able to make any complicated project using Excel VBA. Just you have to do a little practice. If you see videos regularly on YouTube to learn Excel VBA, then you know about this YouTube channel. This channel is run by Daniel Strong. He has enriched his channel with a huge number of video tutorials on Excel VBA. Whatever your problem is, you will get a solution with this YouTube channel. Studies confirm that visuals are processed 60,000X faster in the brain than text. If you’re a newbie to Excel VBA, I suggest you go with a video course. It is true that there are plenty of free videos are there on YouTube on Excel VBA, but what you need is a true guide who will start from basic, keep you engaged and on track with lessons, quizzes, and other essential materials. 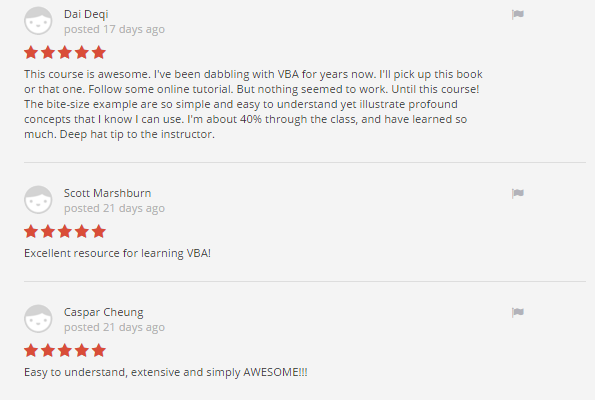 Daniel also runs a popular course on Excel VBA at Udemy platform, the world’s largest platform for online courses. Get Daniel’s Ultimate Excel Programming Course! The Ultimate Excel Programmer Course. When I am writing this post, the course has 30,438 students and the average rating of 318 students is 4.7. After I have joined Udemy as an instructor, I was following Mark Talbert’s this course (Ultimate Excel VBA). I had a plan to make a course on Excel VBA. But after seeing the popularity of Mark’s course, I refrained myself from making the course. Mark has been using Excel since version 1.0. And here are some reviews in his course. Udemy reviews are 100% genuine and trustworthy; computer bot automatically removes the manipulated reviews from the courses! 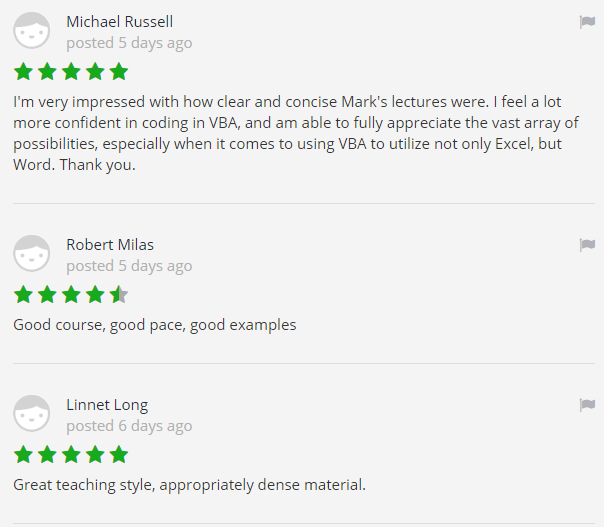 Get Mark’s Ultimate Excel VBA Course! In an age of online information, it seems that appeal of books to readers has deteriorated. Started writing a VBA code and did forget the syntax of a constructor? Just go to Google and convert your problems in some phrases and hit Enter. You’re all done. Millions of results will appear to you immediately. Searching in a book for some problems? OK. It will take time. Go to the Index page, then count a, b, c, d, find out your relevant topic, go to that page, and get an idea of your findings. A long-term process really and there is no guarantee that you will find your problem topic in your book. Then why every expert says that you need a book on your topic? My advice is same to you. You need one or two books in Excel VBA. It might be in PDF or it can be a hardcover book (preferable). When you will enroll in an online course on Excel VBA (or on any topic), it is true that you will learn almost all the topics within the shortest possible of time. But a video course can be compared with a regular classroom where your instructor just gives you the general view of the topics. You then go home, open the book and read the topics that you have learned in your classes and do some practice problems. And you’re all done. So, still, at this age of quick information, a book is an inevitable asset at your table. Here, I will give you a list of total 3 books that you can consider buying. These books are really helpful and the readers have shown their high gratitude to the authors of these books through reviews. Read More: How different is VBA from other programming languages? The author of this book is John Walkenbach and this the best seller book on Excel VBA. John Walkenbach doesn’t need any introduction to the Excel users. He is known as Excel GUY and if this is your first day of introduction with Microsoft Excel, you may have heard his name. After you have read the general syntax and structures of Excel VBA, what you may need is developing applications using Excel, VBA and .NET. This is the book that is written keeping in mind the application developers. Just buy it and after reading some chapters, you will think you should read this book 15 years ago. This is not a book on Excel VBA. But when you’re working on Excel VBA intensively, I guess that you’re in the finance sector and your job may be related to building financial models for your company. The write of this book is Simon Benninga. He is considered as the father of financial modeling. Download 1200+ Excel VBA code snippets from the link below. The codes are just made for you to use it in your any project. I hope I could give you an outline of how to be a master in Excel VBA. 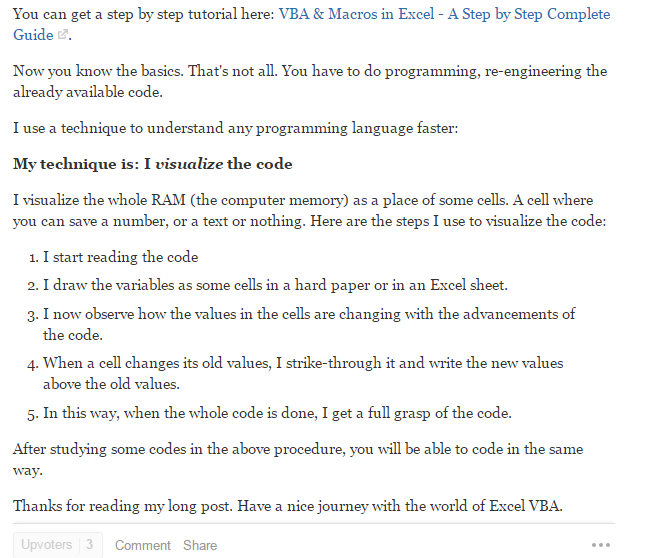 You got my answer on Quora on How to learn Excel VBA. Then you got the step by step tutorials to learn Excel VBA completely. 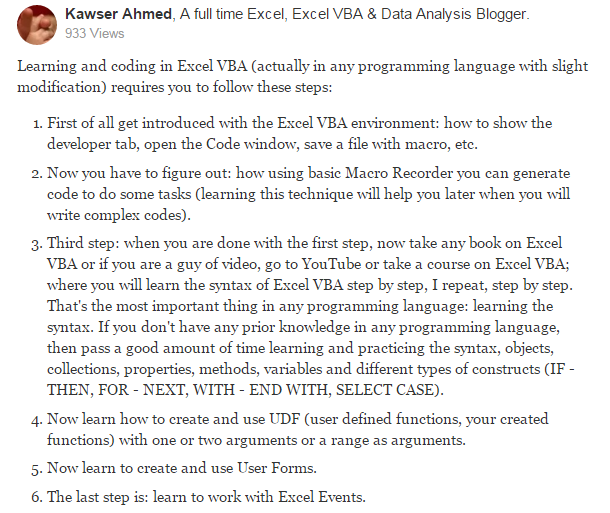 I have introduced you to Daniel’s YouTube channel and his course on Udemy where you will get thousands of videos on Excel VBA. Then I have provided you an Excel VBA pdf where you can get 1200+ Excel VBA code snippets. If you have any suggestions or feedback on how can I make this post more helpful to you, please provide it in the comments box. How to Save Macro to Personal Macro Workbook? I have a database in one folder. Plz Unzip and see all excel files shown datewise. Can anyone help me in extracting day wise data of parameters in format shown in Monthly tracker sheet. Please check the format. It should be like if i select one workbook data from only that one will be extracted, if selected 2 data from one and two both so on and so forth till 31 days. i am uploading the the database and monthly tracker. I’m interested in Daniel’s course for $10, but when I click the link it comes up as $80. Is there a coupon code I need to enter to discount it to the advertised $10 price by Aug. 30? Same situation here, a wanted to buy the The Ultimate Excel Programmer Course. but the coupon expired. is there any way to have it back? Good day Kawser. I like to download the “1200+ Excel VBA Code Snippets”. Since I am all ready a subscriber of your blog and don’t like to subscribe again : Where I can access this or even other useful PDF’s and “Tons of Excel Recsources” ? Good morning, I have created a worksheet with columns A through AB. Some columns contain the formulas needed for processing the information that is input and these are summed at the bottom of the columns. Three columns contain checkboxes which are used to activate a particluar column for a calculation. The checkboxes begin on row 3 and exist in column B, C and D. The checkboxes are linked to their respective row in columns Z, AA and AB which is used to test for the state of the checkbox. Periodically, the number of rows with the same layout has to be increased a larger amount of data. I have been trying to find a VBA solution that after clicking a button on the worksheet, a new row is added with all of the relevant formulas and link the 3 checkboxes to the new row at columns A, AA and AB. Since I just discovered your site, am in the process of reading through your material but there is just so much of it and am in need of this solution right away. Can you help? Would you please advise how can I exclude specific cells from range copying in VBA? For example, how to copy data in Cell No. A1 and A4 (without copying data in A2 and A3)? I was able to find VBA Code Snippets from the Resource page. I tried to download Excel VBA Code Snippets from the Resource page… I keep get send back to the email sign in page but still do not see any option to download this code.